Spray the inside of an 8-inch springform pan with baking spray. Preheat oven to 325°F if using a non-stick pan or 350°F if using a metal pan. GRAHAM CRACKER CRUST: Stir together graham cracker crumbs and melted butter. Pour into springform pan and press into an even layer. BROWNIE LAYER: Mix together the brownie mix with water, oil, and egg just until combined. Pour over graham cracker crust. Bake for 34-38 minutes. Remove from oven and allow to cool completely. MARSHMALLOW CHEESECAKE MOUSSE: Beat cream cheese until light and fluffy. Add marshmallow fluff and beat to combine. Fold in the whipped topping. Spread over top of brownie and refrigerate for at least 4 hours. Remove and un-mold from pan. CHOCOLATE GANACHE: Stir together heavy whipping cream and corn syrup in a microwave safe bowl. Heat on high power for 45 seconds. Pour chopped chocolate into hot cream and let sit for 3 minutes. Stir until smooth. If needed, heat for 10 second increments, stirring after each until melted. Allow to cool until slightly thickened. Pour 3/4 of the chocolate ganache over the top of the cheesecake. Toppings: Sprinkle mini marshmallows and graham cracker pieces in the center of the cake. Drizzle on remaining chocolate ganache. Turn a favorite summertime treat into a festive dessert that will wow guests at any party. With just one glance everyone will be blown away by the sheer beauty of this cake. 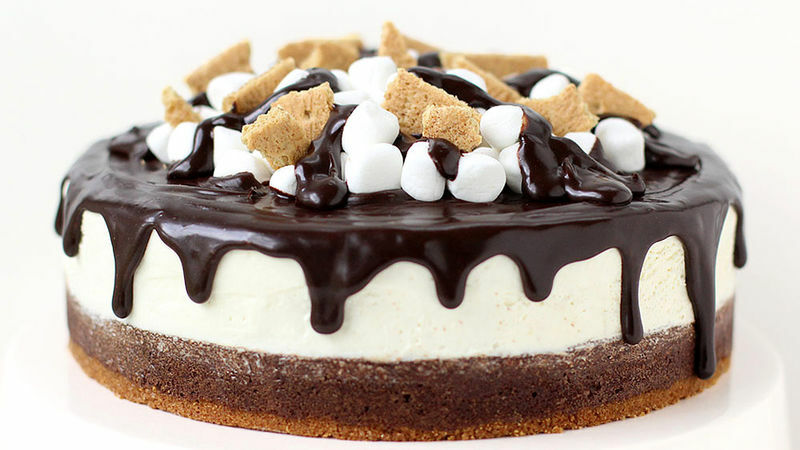 Then you'll cut into it and pass out big slices of graham cracker crust, topped with ooey gooey chocolate brownie and a thick layer of creamy marshmallow cheesecake fluff all topped with decadent chocolate ganache, mini marshmallows, and graham cracker pieces. The first recipients won’t be able to resist taking a bite and will be grinning from ear to ear before all the slices are even served. With each bite they'll enjoy crunchy, chewy, fluffy, silky, and soft textures, as well as, the traditional flavors of a S'mores. To make this cake, you'll start by baking a graham cracker crust topped with a Betty Crocker Brownie in an 8-inch sprinform pan. Once you smell the incredible of aroma of chocolate and warm grahams wafting through your kitchen and your brownie is baked through, set it aside to cool completely. Then make a big bowl of creamy marshmallow cheesecake fluff and spread it over the cooled brownie. Now, you have to wait for at least 4 hours. I know, it's rough, but you really need to give your cheesecake layer time to chill and firm up so it makes a pretty looking dessert. About 30 minutes before your cheesecake is ready to come out of the refrigerator, you can get your chocolate ganache made. It needs a bit of time to cool so that it will thicken enough to make great looking drips on the side of your cake. When it's ready, pour it around the top edge of the cake, allowing it to drip every so often. Then fill in the center. Be sure to reserve a bit of ganache for later. While the ganache is still nice and soft, sprinkle (or neatly place) mini marshmallows and graham cracker pieces over top. Then drizzle the remaining chocolate over the top of the marshmallows adding the finishing touch to this spectacular dessert. Cut big slices of cake for everyone to enjoy.